Helen Ching-Kircher and Roger Federer in Perth, Australia. 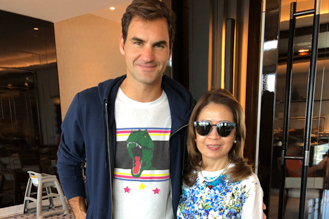 Helen Ching-Kircher meeting with Roger Federer at the Crown Towers in Perth, Australia. Roger was getting ready for the finals Switzerland vs Germany at the Hopman Cup 2018. They met during one of their daily breakfasts at the executive club. Helen Ching-Kircher also has a great chat with the family and player Alexander Zverev from Germany.